This week's post is from Julie Marlow, a Palmer/Pletsch Certified Sewing Instructor, will be showing us how to make a color-blocked t-shirt. Julie Marlow has been teaching at Charlotte Sewing Studio for about six years. She has line-up of garment sewing classes including a perfect t-shirt class, pants fitting and the t-shirt of the month. Some of the other classes have evolved to include the creative use of embroidery in apparel as well. Theresa Bahadoor is the owner of the sewing studio, which is a 10,000 square foot facility stocking garment and quilting fabric. They also carry four lines of sewing machines and all the accessories for Singer, Viking, Pfaff and Bernina as well as an array of notions. My inspiration for this colorblocked t-shirt comes from playing with shapes and fabric making it pleasing to the figure. I hope you will enjoy making this t-shirt by adding your own personality into it. 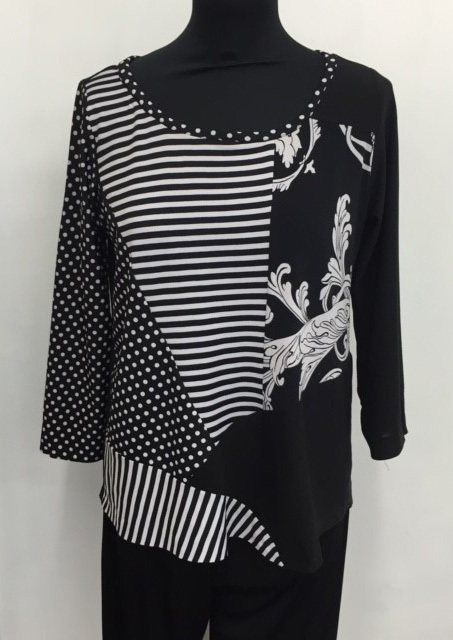 The pattern used for this project is Pamela's Patterns The Perfect T-Shirt. The fabrics used in this example are ITY knits, but any jersey knit can be used. Ponte knits can also be used, but the mixing of knit weights (ponte and jersey in the same time) is not suggested. Try to keep with similar weights when choosing the fabrics for this project. 1) Draw the full front of your t-shirt pattern (left and right side front) two times. One of them will be used for drawing out your design and the other will be used in the end to square up the front of the shirt. 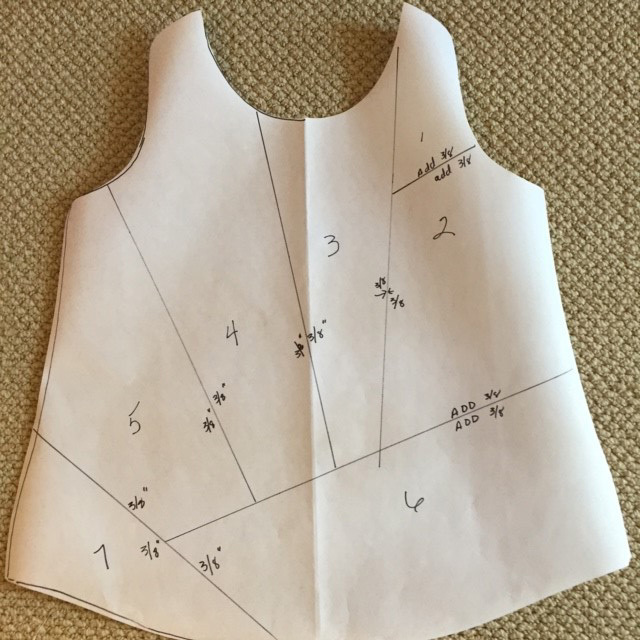 3) Mark your pattern as shown, numbering each piece. 4) Cut out each piece and add 3/8" to your divided areas on both sides. (This is your seam allowance.) Use scraps of paper to add the 3/8" or remember to leave extra space when you are cutting the pieces from fabric. There is no need to add extra seam allowance on to the side seams, hem, shoulder or armholes since the seam allowance is already built into the pattern. But if you add it, it's no problem, you will square it up later. 1) Lay out your fabric in a pleasing way to give the look you want. 2) Cut out your pieces. You may want to extend your pieces a little bigger to the outside so you have room to re-adjust your front piece. 4) One sleeve will be part of the main body, one sleeve you will match the side piece that is closest to your sleeve. 1) Add stay tape under the horizontal areas to keep the knit from stretching as you sew. We recommend SewKeysE 1/2" Knit Stay Tape. 2) Starting with #1, seam together all of your pieces. 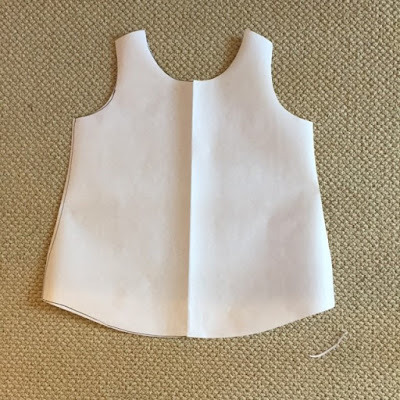 3) Lay your second traced front pattern down and recut out the front, squaring up the pattern so that it's easier to sew to the back and sleeves. 4) Reinforce your back shoulder seam with the 1/2" knit stay tape. 5) While you are at the iron, add 1/2" stay tape all the way around the wrong side of the neck edge. Sew the neckline on to the shirt per pattern directions. 6) Sew in your sleeves per the pattern directions. 7) Sew your side seams and try on for fit. Adjust as necessary. 8) Hem the bottom and sleeves with 1” Double-sided Fusible Stay Tape. Here is one of my student's finished colorblocked shirt. It turned out great! Thanks again to Julie for putting together this tutorial! If you are ever in the Sarasota/Ft.Myers area of Florida, Do check out Charlotte Sewing Studio and the classes they have to offer. It's a beautiful store! Next week Tereza from Sewing for Me will be showing us how to change a basic t-shirt pattern into a raglan sleeve shirt. Every Monday throughout the summer, we will share with you a pattern hack on a t-shirt pattern. I like this idea, but the numbering/sewing order is incorrect. #2 should be #1, #3 should be #2, #4=#3, #5=#4. #6 should be #5 and #1 should be #6. The numbering shown in the photos is correct. You start with #1, the shoulder, then sew that to #2 (just below that) and so on. Does that make sense? Love the idea. I'm an hour and half (one way) from my favorite store (Charlotte Sewing) so I don't get to take as many classes as I would like. Thanks for coming up with this idea. Hope it brings in a lot more business. Love the expanded classroom. Love the t-shirt and Pat is a perfect model! I'm going to have to come in, purchase the pattern and some t-shirt fabric! Thanks for the inspiration. I love this T-Short! The fabrics are beautifully coordinated and I'm going to make one for myself! Thank you for sharing! Wow, this is just so very stylish and cute! Thanks for sharing your method! It makes for a stunning Tee!